On the edge of an industrial estate and just minutes away from the Liverpool Airport, the half-timbered black and white Speke Hall is a piece of history tucked in among modern-day Liverpool. Once on the brink of ruin, this purportedly haunted 450-year-old Tudor house is now a popular Liverpool attraction, and is also the departure point for tours to the neighbouring former home of Sir Paul McCartney. Speke Hall boasts beautifully restored rooms, lovely gardens, and spectacular views of the Mersey basin and the North Wales Hills across the high bank of The Bund. 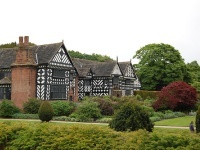 Speke Hall is also a popular venue for events such as weddings and it plays host to various concerts, particularly over the summer. Guided tours by costumed guides are available, and tours of the roof space are also available on selected days. The Home Farm is about five minutes from the house and has a visitor's centre, a shop and a good restaurant.